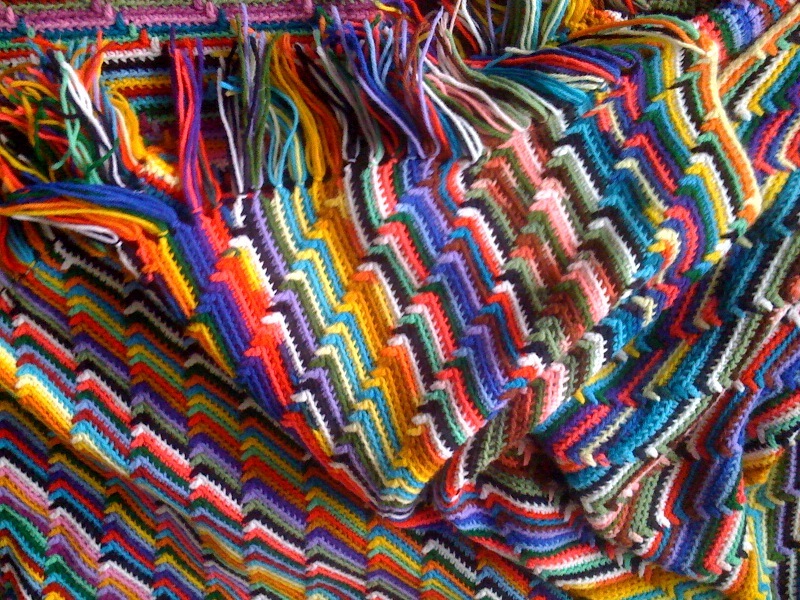 Katie Puckrik, writer and broadcaster, on a blanket her mother made. This blanket touches me for several reasons. There’s the fact that she made it for my father. My mom and dad didn’t have a very affectionate, loving relationship. My dad was quite withholding, which he regretted by the end of his life, when he finally understood that it wasn’t the way to have love in your life. But they still tried to reach each other and one of the ways my mom was trying to reach out to my dad was by giving him this offering in colours he loved. My mom is very tasteful and her colour choices would be more elegant and refined. Dad used to joke, “the Puckriks were a just bunch of peasants” – his folks were Slovaks from the Carpathian Mountains. He loved bright colours – reds and lots of clashing dissonance, even in his clothes. So she reflected that in the blanket and chose colours that were to his taste rather than hers. So I like that it was an offering to him, trying to bridge something between them. I also like the fact that it’s a reminder of her somewhat thwarted creative ambitions. She was able to create throughout her life, but I know that before she met my dad, she wanted to be a fashion designer. When she was at university, she got involved with theatre productions and she designed and made the costumes. But she and my dad got together right after World War II, and that was an era in which a woman usually became a homemaker, unless you were prepared to really defy convention. My dad was an Air Force officer and then a diplomat, so we lived all over the world – in Moscow, Berlin, various places in America. So she had an outlet as a diplomat’s wife, which is a job in itself. You’re in charge of throwing these James Bond style, tinkling cocktail-glass parties. I’m moved that her creativity was still able to come out in these domestic ways and that it was inspired by her family. I was like a little doll for her to make clothes for, and when I began to study ballet, she would design and make the costumes. GB Did you grow up with a view of women as old-fashioned 1950s housewives? KP For some reason, even though neither of my parents particularly instilled this in me, I always gravitated towards mavericks. When I was thirteen or fourteen I was reading about Frida Kahlo, Peggy Guggenheim, Zelda Fitzgerald, all these rebellious women who were either artists or writers or just extraordinary individuals who flouted convention. I definitely had a cross-pollination with my dad being more outrageous and my mother being more cultured: loving dance, theatre and beauty. The third reason I love this blanket is for what it is. It’s comforting and warm and soothing. I’m in a big transition in my life, and it comforts me. I was working and living in Los Angeles and I’ve come back to London, which I really feel is my home. I’m picking up the writing and broadcasting work that I was doing here when I first established myself in television in the 90s. Most of my belongings are still in Los Angeles, but I had to bring the blanket with me because it’s home, it’s mother, it’s family, it’s beauty, it’s art. By day it’s draped on a chair, and I can admire it. By night I sleep under it, and it keeps me snug. GB Did your dad appreciate it? It looks as though so much love has gone into it. KP He did appreciate it. He always had it on the couch in his study. I wasn’t really sure of the blanket’s significance to him until the year before he died, when I asked if I could have it. He said, “Well, no, your mother made it for me. You can have it later.” He meant when he was gone. GB Do you believe in universal beauty? I can’t imagine anyone not finding this blanket beautiful, for instance. KP Everyone loves a kitten! Everyone is down with a sunset. Entire religions were formed around sunsets and sunrises. Everyone loves the moon and the sound of the ocean. You can’t go wrong with nature. But then you start to get into taste and cultural signifiers. Things that seem ordinary in one culture are extraordinary in another. GB Would that apply even between LA and London? KP Yes. LA is a factory town. There’s only one business, and that’s show business. It’s about status, and you can see that even in terms of what’s personally attractive: the way people are groomed and have surgery or work on their bodies and faces. GB Did you prefer to have different things around you in the context of LA? KP No, in fact I was laughing at myself because I recently moved into my new home here in London, and without thinking about it too much I seem to have recreated a microcosmic version of my LA apartment. I’m like a turtle with a shell that contains my aesthetic wherever I go. GB Did you inherit much of that taste from your mother? KP My mom is a DAR: A Daughter of the American Revolution. You can trace her family right back to the American colonies. Her taste dovetailed with that. She always loved early American Colonial style. I don’t share her particular aesthetic, but I sure picked up her love of textiles and handmade things. GB Does something have to have this emotional quality to it, to be beautiful to you? KP You can’t always have a personal relationship with beauty. Sometimes you can have an esoteric connection, and sometimes it’s painful, like a poke from something that reminds you of your inferiority, because you’ll never live up to the beauty. It can be sort of sneering at you. But in the case of this blanket, it’s so much more. When I wrap it around myself, it’s almost like my mother and father holding me. KP It has to give me pleasure, delight and awe. And there’s mystery. You can’t fully understand beauty. Even with the blanket, I have no idea how my mom made it. GB I suppose your parents’ relationship held a lot of mystery. KP You hit the nail on the head.